Creative Placemaking can most succinctly be described as an evolving set of practices that involve community members in revitalizing and developing their communities in a way that includes arts and cultural workers and their products to enhance everyone’s quality of life. It could be argued that projects similar to creative placemaking have been undertaken for decades; however it is only recently that the term has been developed and has been gaining traction as a focus of community development funding and projects. Such projects offer many opportunities to which community psychologists might contribute. There is a great diversity in the types of projects that have been funded to date. Low income or supported housing or live/work sites for artists, mural projects that involve youth in a training component, development of a community arts center, mobile apps that link local artists to potential customers, and a series of art-centric events in an abandoned site exemplify the range of possibilities. This suggests that funding can be available for imaginative larger scale projects where a strong sense of place is integrated with arts and culture to inform project development and final products in a way that brings vitality to a languishing area or community. One of the benefits of creative placemaking is that it supports cross- sector partnerships. Public, non-profit, and private ventures are called upon to work together. It also invites cross-discipline work, as transportation or housing agency entities may become involved with community or arts and cultural individuals and institutions. It is seen by many as a way to better leverage an investment because of the many players involved. Some examples follow. 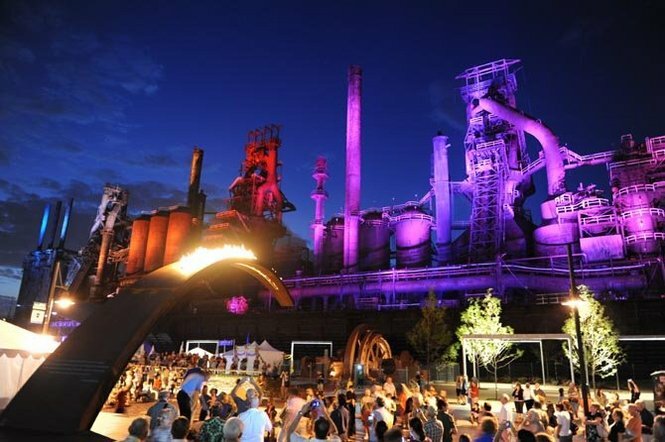 Local Initiatives Support Corporation’s (LISC) Institute for Comprehensive Community Development is one of several organizations that have conducted several major creative placemaking projects throughout the US. One of these was Resilient Communities, Resilient Families, launched in 2011 in Boston. To engage residents, community organizations, and other stakeholders in the planning process they asked, “What’s next for the neighborhood?” Artists emerged as key players. They both articulated the importance of culture in community revitalization and brought creativity to the planning process. They helped bring to life who lived in the community, what mattered most in terms of quality of life, and why the community was loved through means such as storytelling or creative depictions that went beyond traditional data gathered. Working to facilitate the success of artists as entrepreneurs, services devised included business plan training, increased access to capital, and expanded venues for arts performance and display. A project highlight was Bartlett Events, a summer-long series of events held at a vacant bus yard slated for redevelopment. Murals adorned the site as residents came together in new ways. Another innovation was the development of a social enterprise initiative called New Art Love that created a mobile art application to link local artists to potential buyers for their work. Descriptions of other projects can be found in their Thinking Out Loud blog about creative placemaking (http://www.instituteccd.org/resources/5010). In Lawrence, Kansas, the Lawrence Arts Center received $500,000 last year from Artplace to implement the “Free State Boulevard: From the Studio to the Streets” project, designed to revitalize and re-engage a six-block stretch that links downtown Lawrence with a warehouse arts area. Multi-modal paths, upgraded amenities, and new models of urban infrastructure are planned to help integrate and cross-pollinate the two communities. Fargo, North Dakota received $450,000 from Artplace last year to further develop and implement plans for a World Gardens Commons that would transform an 18-acre storm water detention basin that has historically isolated the Native American and immigrant populations living next to it. An environmental artist is leading teams of artists in partnership with social service organizations to involve residents in programming and activation. This builds on the $260,000 awarded in 2013 to the Plains Art Museum for plans for Defiant Gardens in the Fargo-Moorhead communities. The Rebuild Foundation was awarded $125,000 in 2011 by Artplace to convert an abandoned building in the Dorchester neighborhood of Chicago’s South Side into the Black Cinema House Live/Work Space where films, videos, and media works arising from the community will be made, shared, and discussed. The scope of this project was expanded and additional funding was secured. The Washington Park Arts Incubator is a joint project of The University of Chicago Arts and Public Life Initiative, the Office of Civic Engagement, and the Center for the Study of Race, Politics and Culture, which built on the initial impetus of the Rebuild Foundation. It received $400,000 in 2012 to continue work on this vision. The three artists-in-residence announced for 2013-2014 were a musician and composer, a poet and visual artist, and an artist, designer, and educator. As can be gleaned from the above, a major funder of creative placemaking projects is Artplace (http://www.artplaceamerica.org). It is a consortium of twelve foundations and two anonymous donors, with six major financial institutions as partners, and several federal agencies providing advice and counsel as well. Artplace has invested a total of $56.8 million in 189 projects in 122 communities across 42 states and the District of Columbia since 2012 in amounts ranging from $50,000-$500,000. Many of the foundations that are part of the Artplace consortium also fund projects on their own. One of these is The Kresge Foundation (http://kresge.org). It also partners with other foundation members of the Artplace consortium such as the Surdna Foundation. The two recently announced a plan to award $1.3 million to seven community development financial institutions in a two-year effort to integrate arts, culture, and creativity into community revitalization efforts. Such a broad definition can be good news for folks involved in community psychology and community work, because it means there is room for creatively developing projects that can get some of the generous funding that is starting to be earmarked for creative placemaking. Nicodemus has noted some challenges within the new field. Its metrics are still being developed: How are things like return on investments measured and evaluated and by whom? Key values like agency, equity, and vibrancy can be elusive. One major criticism is that revitalizing blighted or neglected neighborhoods by making them attractive to arts and culture-minded entrepreneurs and their consumers might displace place the current residents. 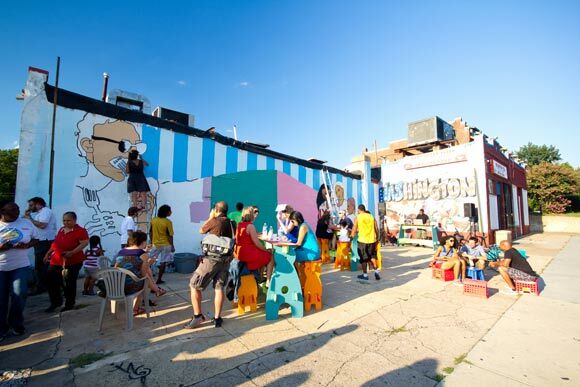 Is Creative Placemaking another form of gentrification? Many of the actors in this field seem to be conscious of this possibility and are looking for projects that actively involve and support residents, who would have a central role in project design and development. Local art and culture can be an essential element of community work; and local artists and cultural workers, as well as community psychologists, can be key participants in it. The arts can open people to new possibilities and help build bridges across differences. Including them intentionally in one’s projects can have many benefits, including access to increased funding sources and inclusion in the discussion of an evolving new field. Best of all, working this way can be a lot of fun for all involved. Great article! Can you tell me where these projects in the pictures are physically located?